The Oxford dictionary defines critical thinking as an objective analysis and evaluation of an issue to form a judgment. “Critical” was derived from the Greek word “kritikos”, referring to “critic” or “critique”. This refers to the intellectual capability to discern or to judge. Richard W. Paul first described this term in 1994 and defined it as “an analysis involving clear and rational thinking”. There are three core skills involved in critical thinking: curiosity (to know more), skepticism (to question the validity of facts), and humility (to accept wrong ideas when presented with factual evidence). To sum up, critical thinking skills refers to the ability of searching, analyzing, comparing, evaluating, conceptualizing and judging based on facts and evidence. We use a lot of our critical thinking skills in our day to day lives, be it in school, at work, or even within our homes. Developing our critical thinking ability is a continuous task, but the key to using it more productively is to start building it when we are still young. A good foundation will make it easier to hone these skills as we grow up. Did you know that babies are already able to use their critical thinking skills? Beginning six months of age, infants may start to conceptualize and practice their constructive skills through toys and play time. Offer your baby some safe, educational baby toys like plastic blocks or colorful stackers. Let your baby put up several blocks or place the rings on the stackers. It doesn’t need to be perfect for the first time. Don’t intervene immediately if the blocks suddenly fall down or the rings aren’t in their right places. Offer your baby the chance to discern it all by himself. Allow ample time for your baby to think about where to place each toy, or which one goes together. You might be surprised at how he or she can sort out toys depending on their shapes, sizes and colors. Let your child play at his/her own pace and time. Encourage your child to role play. Role playing would offer him/her some open-ended opportunities to think and try something new. Consider investing in brain development toys. Allow your child to explore the environment. Offer a safe place in your backyard or bring him/her to a nearby child-friendly park. Communicate with your child and do your best not to ignore his/her queries. Allow your little one to tell his/her own story. Read to your child and encourage him/her to ask questions. Have some creative ways to get your child become interested in Math, Engineering or Science. Let your child make choices, be it in what clothes to wear, how much of their money to spend or what sports to engage in. Allow your child to plan his/her daily activities. Give him/her the privilege to have some hands-on experiences like letting him learn how to ride a bike, or allowing her to cook a simple meal under your supervision. Be a role model in terms of decision-making. Verbalize your thoughts about certain issues that need your judgment while your child listens. This will help him/her make sound and critical decisions in the future. 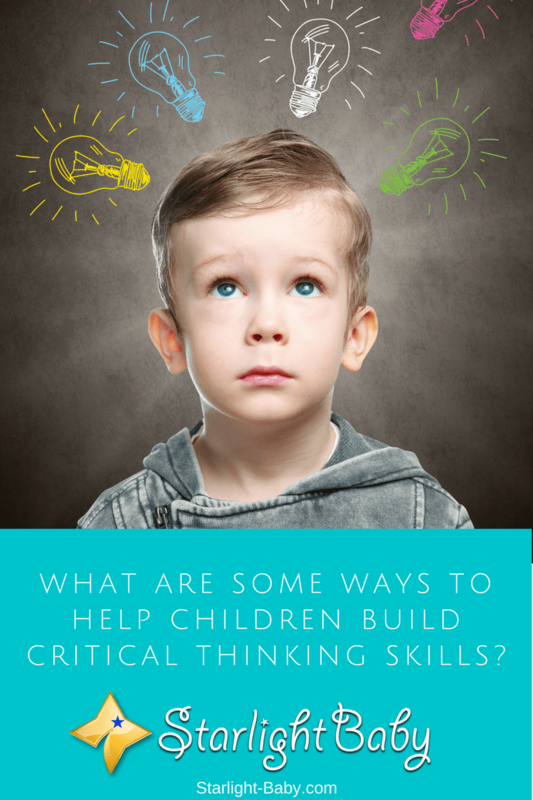 Overall, these are just tips to help you build your child’s critical thinking skills. Of course, this list is not complete, and making attempts to stimulate your child’s brain will undoubtedly prove very beneficial for their neural development. As a father of a 7 months old baby, I am concerned about the physical as well as mental development of the baby. I am reading a lot of materials on how to help the baby develop critical thinking. I found this article very useful. I believe that giving interactive toys, communicating with the babies, letting them play with other babies are some of the ways to develop critical thinking in your babies. We’re really glad you find this article useful. Thank you for the feedback. Yes, as parents, we should always be concerned about our child’s physical and mental development. And I agree with your suggestion about interactive toys, communication, and playtime. Once a child is born, I would believe that the moment the child’s brain begins to process stimulus, critical thinking has already started in the child’s life. He or she can process when hunger comes knocking and starts crying immediately to be fed. The same thing goes with toddlers and teenagers, as they are growing, they seem to develop more critical thinking. The toys helps a lot with their development as they growing. You’re right, a child’s brain can already develop critical thinking skills at a young age. However, I think others are not able to fully develop this skill because some do not seem to comprehend the consequences of their actions or just do not have common sense. So yes, let’s help develop a child’s critical thinking skills further. There is no arguing how important a parent’s involvement in developing their child’s critical thinking is because in as much as these kids can learn somethings on their own, they still need all the help they can get in learning more and getting exposed to stuffs they can’t literally know on their own. Yes, exactly – children need all the help they can get in order to learn. Parents know a lot more than children so they are in a better position to educate a child. Amazing tips on how to help the kids develop the critical thinking nature in them. The thing with some toys such as building blocks is that the toddler will get to analzye and plan how to set it to be unique in his own way and as one can see, this is essential when we try to look at it from the child’s point of view. As a kid, I played lots of games that is still helping me become better at analytical thinking and it’s all thanks to how I developed those skills as a kid. I agree Henry, blocks are an excellent way of children being creative, in turn contributes to the development of their critical thinking skills. They can think of objects to form. Some children even explain what they have made. You mentioned playing as a way to develop analytical thinking and I agree with you on this. Pretend play is one kind of game that particularly hone kid’s critical thinking skills as they assume roles and think of the responsibilities of the roles they play. For example, they play cashier and customer roles in a supermarket. They are able to invent conversations that goes on in a store and think of ways to emulate them. They think of prices of items, may add them up and perhaps use fake money which is a way to practice Math skills. It is indeed important for parents and caregivers to allow playtime with peers. I agree. Blocks help in so many ways in developing critical thinking skills. Without this skill, we will not be able to think outside the box as adults.